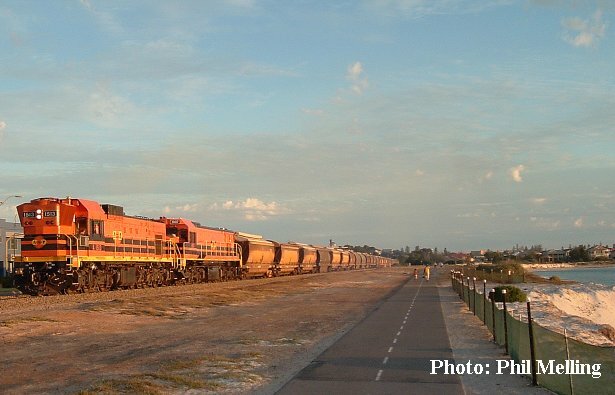 2004 is so far proving interesting with an increase in the number of trains in the area, due to more grain and the new iron ore train. Below are a few selected photos up until May. 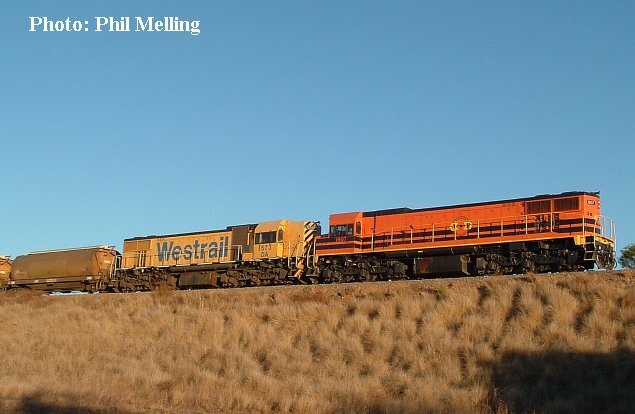 Late in the afternoon A1513/1907 are seen on the front of a loaded grain along Chapman Road heading for Narngulu on 16 April 2004. Rebuilt DA1577 now 1907 certainly has been earning its keep for ARG as these photos above and below show, it turning up on a number of different workings.Since this photo was taken A1513 was renumbered 1203 and transferred to Port Lincoln in South Australia. DA1573/A1514 is seen on the mineral sands at Narngulu on the 16 March 2004. 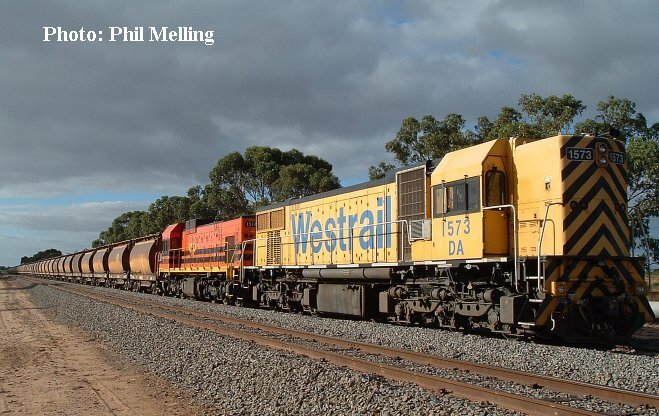 1907/DA1573 lead a loaded grain towards Narngulu through Bringo on the 1 April 2004, only about 10 minutes before sundown. 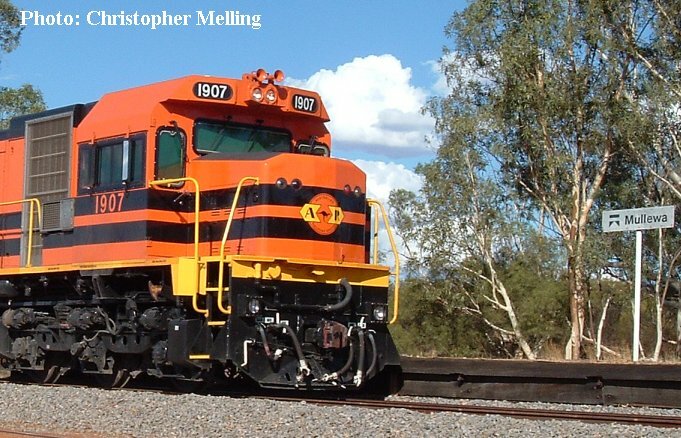 Locomotive 1907 (ex DA1577) at Mullewa on 29 February 2004 at the head of a loaded grain train. 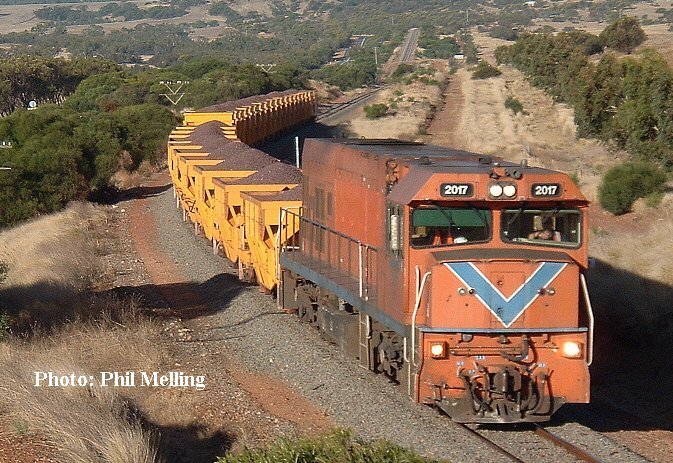 P2017 hauls a loaded iron ore train just west of Bringo heading towards Narngulu/ Geraldton on March 7 2004.Since this photo was taken P2017 has been rebuilt, painted in ARG colours and renumbered to 2517.